The last six years have not been kind to school MIS providers who live in the cloud. Of the 22,000 schools for which data is available, the number of schools using cloud MIS went from approximately 2,300 in 2010 to 2,400 in 2014*. In other words, the market flatlined, and suppliers struggled. Of the twelve organisations to have released a cloud MIS, Pearson and VS no longer have any presence in the English market, and while Tribal have five schools left using Synergy in Schools (down from ten in 2014), they are no longer promoting the product on their website. Even Capita - the market titans, with an 83% market share - have seemingly put their cloud "SIMS 8" project on hold (there's nothing about it on their website, at least) to focus instead on the locally hosted core SIMS product. So you'd be forgiven for wondering whether suppliers should just stop trying to make cloud MIS happen. The 2015 data has just been released (following a FOI request from ScholarPack CEO Rich Harley), and it turns out that in the past year, some 600 schools moved their MIS to the cloud, taking the total to 3,000+. 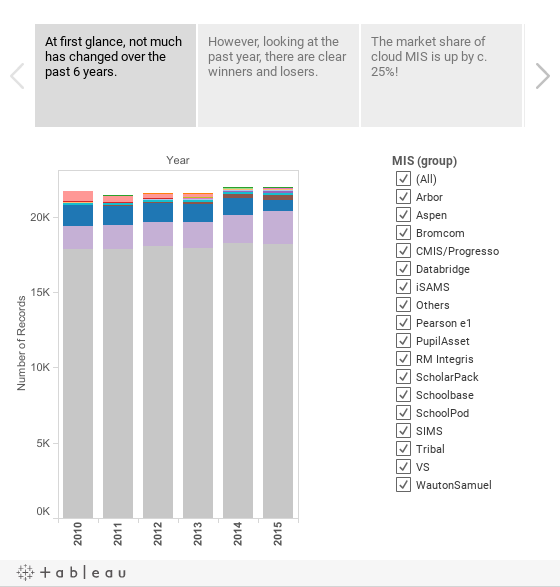 That's a 25% YoY increase in the cloud market share, and that's significant. Both standalone schools and Local Authorities are clearly signing cloud MIS deals with newfound enthusiasm. Here's a short Tableau "Story" (a sort of data-driven Powerpoint, if you will) showing the news highlights in a short series of graphs. Click on the < and > arrows at the top to navigate your way through. Then look below for a bit more commentary from me on what's going on. Promising players are emerging, with RM leading the way: they now have 2,236 schools (mostly primary), up from 1,894 in 2014. It's heartening to see others following hot on their heels - ScholarPack topped 300 schools this year and Pupil Asset also came from the relative obscurity of 31 schools to an impressive 119 (largely thanks to a 100+ schools deal with Norfolk LA). Arbor, Bromcom and Progresso are also all up near the 100 schools mark. That means there are now six cloud players who now have sufficient scale to kick on and compete for business across the country, which can only be a good thing for the sector. Of course, cloud is not the answer for everyone - 18,162 schools still choose SIMS (down slightly from 18,247 in 2014), and they do so because it's a strong product that meets their needs. So nobody is suggesting that the cloud is the only way to deliver a good MIS just now. That said, you only need to look at the Advanced Learning trajectory to see what happens when schools stop believing in a locally hosted system. Since 2010 their market share has almost halved (from 1,380 to 714 schools). It's worth bearing in mind that during this time they've actually started selling Progresso (a cloud system), so the drop off for CMIS (the locally hosted system) is even more dramatic. To be clear, I don't personally endorse or take issue with any MIS. In my most recent role at Ark I have worked directly with a whole host of suppliers and I've seen something to like in every system I've encountered. My new role is to lead Assembly, a joint venture between Ark and NEON that helps schools do more with their data (more on that in the new year), and our approach is to partner with any and all MIS suppliers. Rather, what matters to me is that customers know what's happening in the market, and can make an informed choice. *It's hard to know for sure - Advanced Learning have both a local hosted MIS (Facility CMIS) and a cloud MIS (Progresso), and they show up as the same thing on the DfE MIS statistics releases. It is widely known that Progresso counts for a fairly small proportion of the total, but the exact breakdown is not published, so I am making my own assumptions in arriving at these figures. The statement of purpose mis is so easy and beneficial for the purpose for mba. Much obliged for giving such a helpful data. Plan to get some more data in future too.